Incipit libellus dans modu[m] legendi abbreviaturas in utroq[ue] iure [etc]. Collation: [1-5¹⁰; 6-11¹⁰; 12-18¹⁰; 19-21¹⁰; 22¹⁰ 23⁸]: 228 leaves, leaf /8 blank. Dalbanne and Droz (IX and p. 28), followed by CIBN (M-492), date to 1476 when Schilling was still at Basel (cf. BMC VIII, xxvii) and this is confirmed by a MS date in the copy at Basel (formerly in the Carthusian house there), but Goff to 1478 when Schilling had moved to Vienne. Polain (2746) assigned to Cologne or Basel. Also recorded as [Vienne: about 1478] and [Cologne: 1470] (ISTC). Printed in type 98G attributed to Schilling. Title from incipit (leaf /1r). Werner von Schussenried is named as author of the Modus legendi in an acrostic in the text. 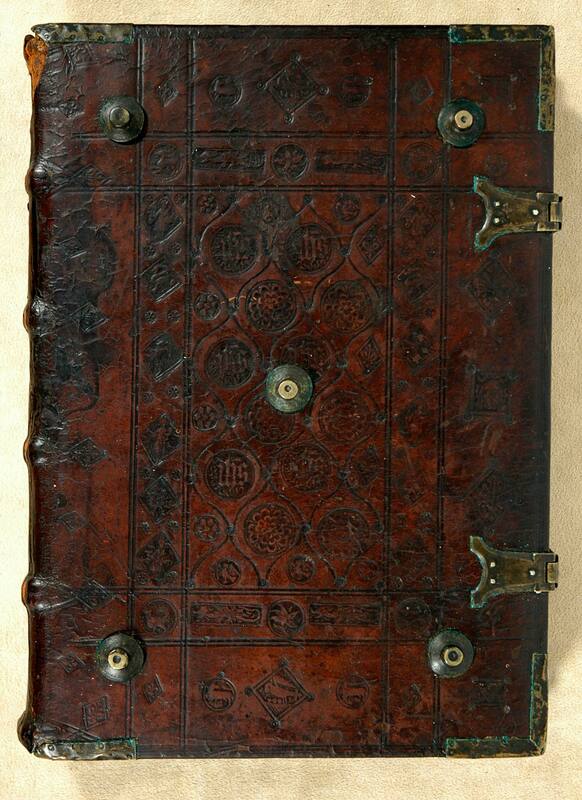 The true author of the Defensorium iuris is Gerardus (or Gebhardus) de Rheinau (BSB-Ink). 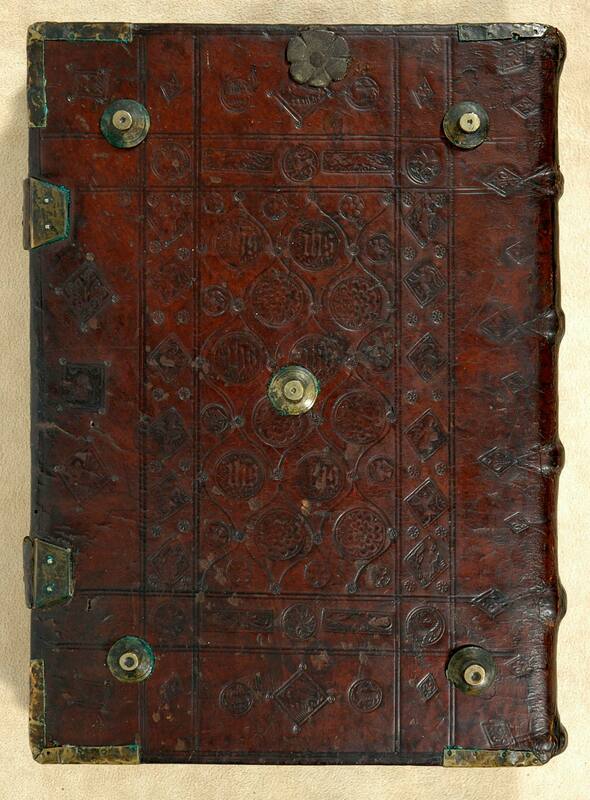 Contemporary blind-stamped leather over wooden boards (29.3 x 20.8 cm), sewn on 4 supports, bound by the Christuskopf workshop at Hildesheim (EBDB w000207); rebacked by Duprez Lahey. Plain parchment pastedown (front) and liturgical manuscript bifolium waste, late-14th/early-15th century (rear) with plain parchment fly leaf (front); plaited endbands. 2 clasps with Y-shaped catches; 5 cardinal's hat bosses per board and flower-shaped chain attachment on top of rear board; metal corner reinforcements. Fore edge tabs for individual works. Hand decoration: Rubricated, red and blue lombards with blue and red penwork decoration, and red paragraph marks; red and blue puzzle initial with marginal flourished red and blue byzants (leaf /1r). Annotations: Contemporary foliation begins at Auerbach, Processus iudicarius (leaf /1r); contemporary manuscript quire signatures. Contemporary notations in several hands throughout and inscriptions on front/rear pastedowns and front fly leaf. J.P. Morgan, Jr., purchased from Martin Nijhoff, 1923.